Boutique gyms, the trending topic in the fitness industry within the last few years. You hear about them, but what exactly are they? Boutique gyms tend to be smaller sized gyms, that focus on class-based fitness in smaller groups. This is more of an intimate setting compared to traditional big-box gyms and how they operate. These types of gyms are more popular especially with millennial’s (age 18-25). People also feel as if they get better results in this kind of setting compared to working out at their own pace and control. Why is Boutique Fitness Booming? Simply put, the fitness industry is changing. The rise of boutique gyms has also occurred as a result of what’s referred to as the “hourglass economy”. Simply put, there has been a shrinking middle class that has added to the upper and lower income classes. Traditional big box gyms such as Planet Fitness and 24-Hour Fitness have staked their claim with the lower income population because of their cheap price tag. On the other hand, boutique gyms target those with higher incomes and spending power. The upper-class is more willing to spend as much as $300/month on a boutique gym compared to those at the lower-end of the income spectrum who pay $10/month at Planet Fitness. This is in part what has led to the disparity in the fitness industry. As a gym owner, you need to decide where you want to be. A traditional gym relies on a larger membership numbers since they have such a low price point. On the other hand, boutique-style gyms tend to have less members that pay a significant amount more in fees on the average. Group exercise has been around a long time, but why the sudden increase in popularity? Some of this has to do with societal and cultural implications. 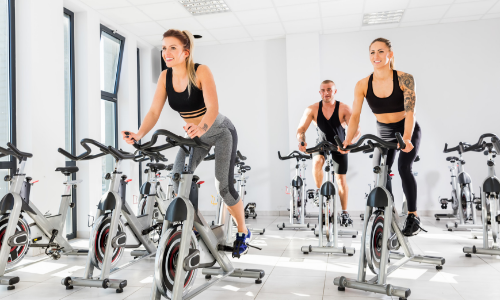 Since boutique fitness was spawned by the younger generation, it seems as if they prefer this type of fitness style while those aged 35-54 are more likely to attend traditional big-box gyms. The younger population also prefers a more community-based exercise experience when it comes to their fitness. According to experts, people living in the 21st century are moving closer towards collectivism and further away from individualism. Especially in the world of social media, people are sharing workout pictures and videos, along with tips and tricks to excel in fitness. Boutique fitness companies have a distinct way of getting people together, while cultivating a special type of energy that creates an intense workout environment where people push not only themselves but others as well. Great example of boutique gyms is SoulCycle, Equinox, and Orange Theory Fitness. They all have different workout programs but provide the boutique-style experience people enjoy. It’s safe to say that the boutique fitness industry isn’t going away anytime soon. A recent study has shown that adults are spending a significant amount more on fitness than their predecessors. For example, one class of SoulCycle costs $34 per class and even some Boxing Gyms can cost $100 per month! There are people who frequent a variety of classes and gyms because most boutique gyms only charge drop-in rates per class and typically aren’t membership-based like the traditional box gyms. The value of boutique gyms keeps going up as they continue to pop up in bigger cities such as Boston, Los Angeles, NYC, and much more places. What kind gym do you attend or own? You will start to see gyms are starting to fall into the boutique or traditional category!